Part cleaning is an essential step in the manufacturing process, as precision metal parts typically have oils, greases and other lubricants on the surface after the part is manufactured. These residues can prevent adhesion of coatings, paints and accelerate corrosion if not properly removed. Manufacturers understand the importance of delivering clean parts in the supply chain process, but they also understand how important it is to have cost-effective cleaning solutions. 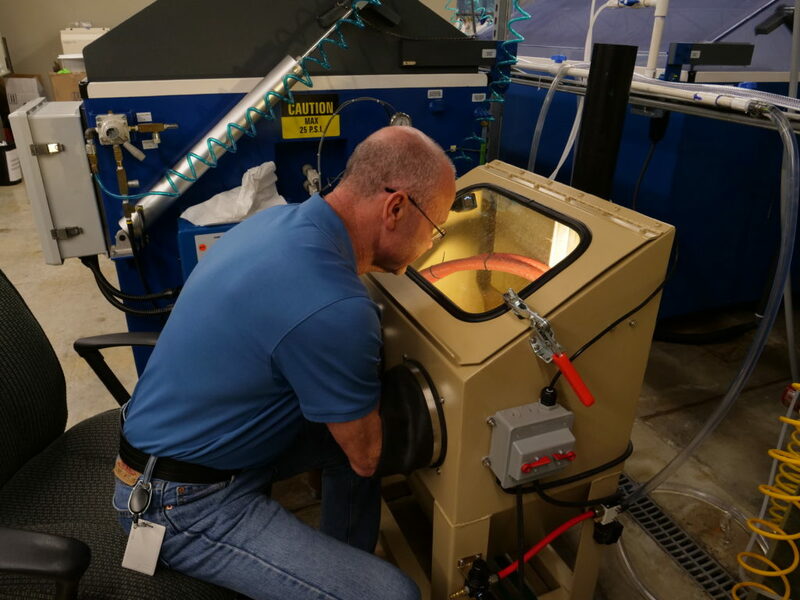 While the actual cleaning process is an expense to the manufactures, this cost is minimal compared to the cost of reworking or having to reproduce new parts due to a rejected shipment. That’s why these manufactures deploy different cleaning processes, depending on the metal part being produced. 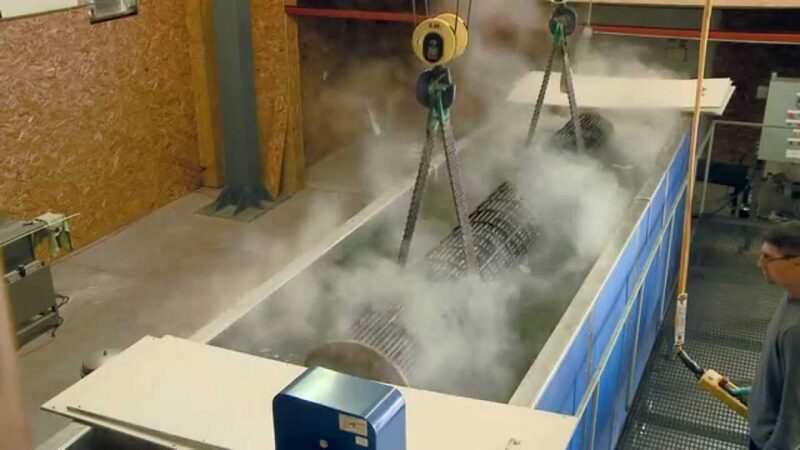 Common cleaning processes include: immersion cleaning, spray cleaning, wet vapor blasting, vapor honing, ultrasonic cleaning, hand cleaning and vibrating tumbler. Zerust has a wide array of products to further enhance these cleaning processes, by cutting the total time to clean the part, enhancing the cleaning, adhesion, while also providing additional corrosion protection to prevent corrosion during shipping/storage. Below you will find the recommended Zerust products that will enhance each of the common cleaning processes, and provide cost savings by cutting labor, cost of rework and minimizing part rejections. Immersion cleaners are engineered to be powerful, efficient and economical descaling and degreasing compounds. They are specially formulated to effectively remove straight oils, soluble oils, metalworking fluids, metal-forming lubricants, carbon scale, heavy soils and dirt, as well as tramp oils and greases from ferrous and non-ferrous metals and associated alloys. Zerust offers AxxaClean™ HPW-100C and AxxaWash™ NW-10 /NW-12 that deactivate ionic contaminants and prevents flash corrosion after cleaning. These cleaners can be used in conventional spray cleaning equipment as well as high to UHP (Ultra High Pressure jetting equipment. AxxaWash NW-10 – Alkaline cleaner that deactivates common corrosion inducing anionic contaminants and prohibits flash corrosion after cleaning. AxxaWash NW-12 – Alkaline cleaner that deactivates common corrosion inducing anionic contaminants and provides short term corrosion prevention after cleaning. AxxaClean 2048 Immersion – Organic acid-based rust remover for light – medium duty rust. AxxaClean 3048 Immersion – Phosphoric-based rust remover for medium – heavy duty rust. AxxaClean CR-20 – Fast, very effective carbon removal. Spray cleaners are engineered to be powerful, efficient and economical descaling and degreasing compounds. They are specially formulated to effectively remove straight oils, soluble oils, metalworking fluids, metal-forming lubricants, carbon scale, heavy soils and dirt, as well as tramp oils and greases from ferrous and non-ferrous metals and associated alloys. Zerust offers AxxaClean HPW-100C and AxxaWash NW-10 that deactivate ionic contaminants and prevents flash corrosion after cleaning. AxxaClean 2048 Spray and Brush-on – Organic acid-based rust remover for light – medium duty rust. Safe for operators and the environment. AxxaClean 3048 Brush-On – Phosphoric-based rust remover for medium – heavy duty rust. Wet vapor blasting is a very powerful, efficient, and economical to use method of cleaning and corrosion product removal. 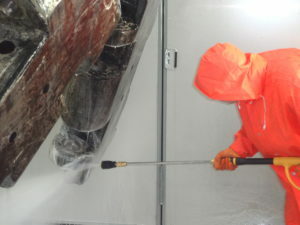 Wet vapor blasting consists of a pressured water in combination with abrasive media such as (sand, glass, walnut, etc.) which is used to effectively remove coatings, contaminants, corrosion and residues from hard surfaces. Zerust offers AxxaVis™ WBA-10 that counters corrosive anions on a metal surfaces while also providing flash corrosion inhibition to protect the surface after cleaning for extended periods of time. AxxaVis WBA-10 is hard water capable. 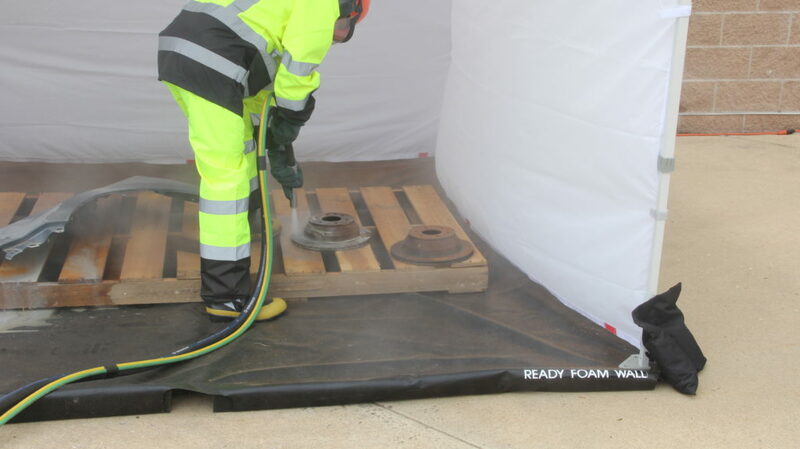 Vapor honing is a very similar to wet vapor blasting as it uses a combination of pressured water with abrasive media such as (sand, glass, walnut, etc.) to effectively remove coatings, contaminants, corrosion and residues from hard surfaces. However, vapor honing is a more scaled down process as it is commonly found in a smaller cabinet. So, this process works well when removing coatings, contaminants, corrosion and residues for smaller machined parts. Zerust offers AxxaVis WBA-10 that treats corrosion-causing chlorides and hardness of water on a metal surface, while also providing flash corrosion inhibitor to protect the surface after cleaning. AxxaClean 2048 Immersion – Organic acid-based rust remover for light – medium duty rust. Safe for operators and the environment. 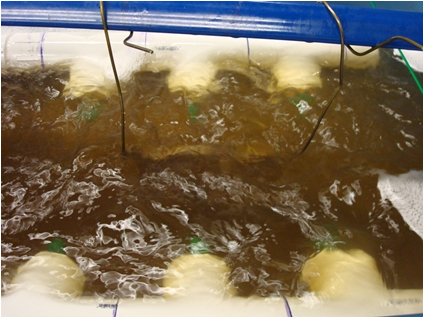 Hand cleaning can be very labor intensive, time consuming and expensive for manufactures. 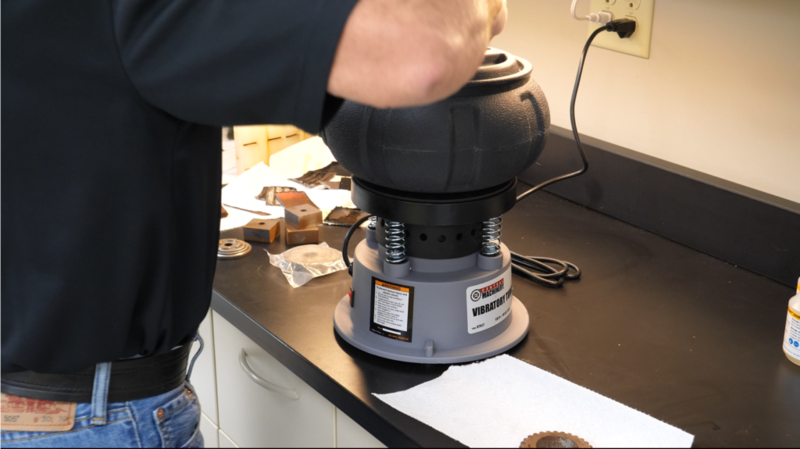 Whenever you have employees hand washing machined parts you typically do not have consistent results, while some parts may end up clean, you may find other parts are dirty with contaminants that may cause corrosion. 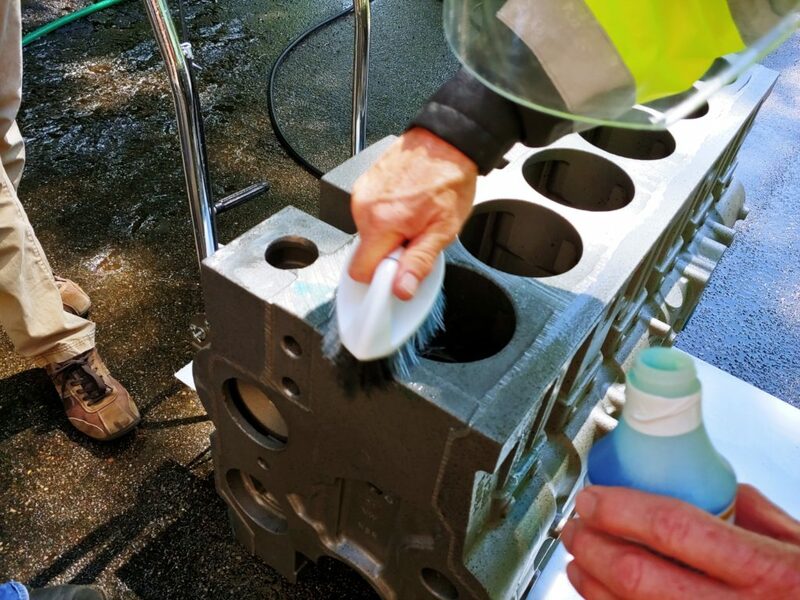 Zerust offers AxxaClean 2048 in spray-on, brush-on, and immersion applications that allow easy hand cleaning solutions while proving fast-acting rust and tarnish remover that also inhibits flash corrosion after cleaning. AxxaVis HST-10 – Effective against corrosive anions with prolonged flash corrosion inhibition. Whichever cleaning process your company deploys, Zerust can help you by enhancing the corrosion protections of your metal assets. We will analyze the current state of your corrosion management needs and work with you and your team to implement the best and most cost-effective solution. Zerust can come to your facility and do a step-by-step analysis of your current process including fluid audits, VCI and packaging process audits, and data logger analysis. Our mission is to provide you with the right products, processes, and procedures to ensure that you can achieve your desired results.